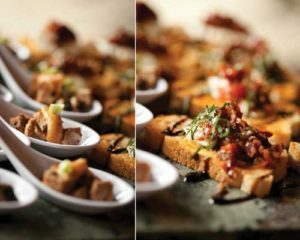 RED ROCK CATERING OFFERS A VARIETY OF MENU OPTIONS, FROM LIGHT SNACKS, BEVERAGES, AND HORS D’OEUVRES TO GOURMET PLATED MEALS. Our menu boasts Northwest style American and European-themed entrees with a wide selection of delicious offerings sure to please the most discriminating palate. Whether working with a smaller budget or shooting for a “sky’s the limit” experience, we can accommodate your needs. Packages start at $10 per person for light hors d’oeuvres, to a range of $20 to $30 for heartier fare, and plated meals begin at $25.